Western Australia’s drive to attract more visitors from India got under way this week when 17 Indian inbound tour operators (ITOs) visited Perth for a familiarisation (famil) trip. Supported by the State Government, through Tourism WA, the famil showcased Perth as Australia’s western gateway and helped educate the ITOs on Western Australia offers visitors. 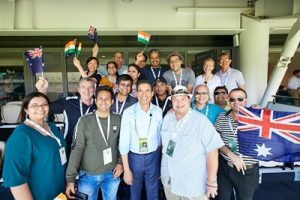 The trip coincided with the first-ever international test cricket match between Australia and India at the new Optus Stadium, where the Indian agents enjoyed watching the first day of play and got the opportunity to meet Indian cricket commentator Harsha Bhogle – the voice of Indian cricket. The group also got to sample fresh, local produce and wines in Swan Valley, met a Quokka on Rottnest Island, learnt about Fremantle’s history, and explored Perth and the Swan River on Segways. The visitors particularly enjoyed exploring the romantic Indian Ocean coast including watching a sunset from Odyssea restaurant at City Beach, just 7kms from the centre of the city. Meanwhile, Tourism WA worked with Tourism Australia to take Mr Bhogle on a famil after the cricket and he shared his experiences including a trip to Rottnest Island and a morning Gondola ride on the Swan River, with his millions of followers on social media. India is the fastest growing inbound market in Australia and remains a key priority market for Tourism WA, with 28,100 Indian visitors contributing $69 million to the WA economy in 2017-18. ““The State Government is serious about growing WA’s tourism industry, and entering a new market such as India, with the potential to deliver thousands more visitors, will help us achieve that goal. “We are working with Perth Airport to secure a direct air link between Perth and India, and this marketing activity will help promote WA and create even greater demand for these flights once they begin.